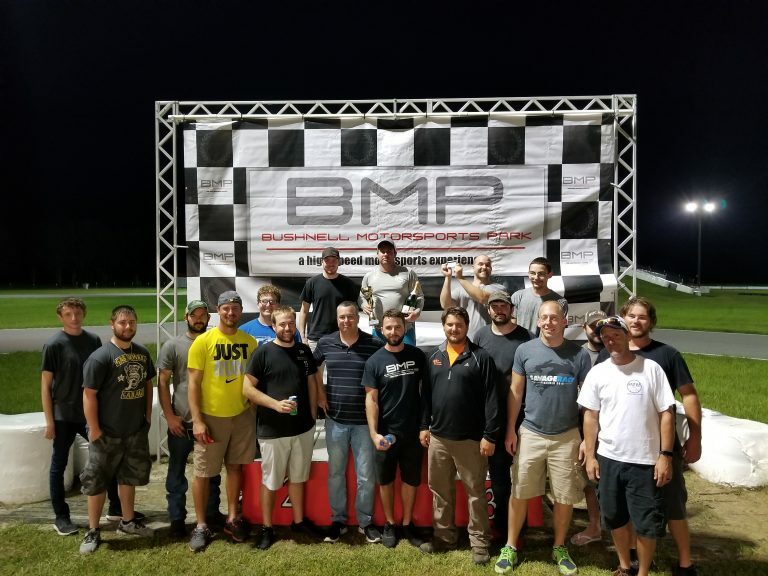 The BMP iDrive Rental Kart League Series puts you in the drivers seat for competitive, fun and intense wheel-to-wheel racing action. All you do is show up – we provide the rest. We supply everything you need to win. All racers will be using karts prepared by Bushnell Motorsports Park to ensure a consistent and level playing field, leaving the rest up to the skill of the driver. The Fall Series will consist of 10 races on 5 dates. Racers compete and receive points based on their finishing spot for each Feature Race. These points accumulate for season-end awards. Drivers will count their best 8 out of the 10 races towards the championship points. Racers do not have to sign up for the entire series to race. Price: $75 + tax per night or $335 for entire season (saves $40!). 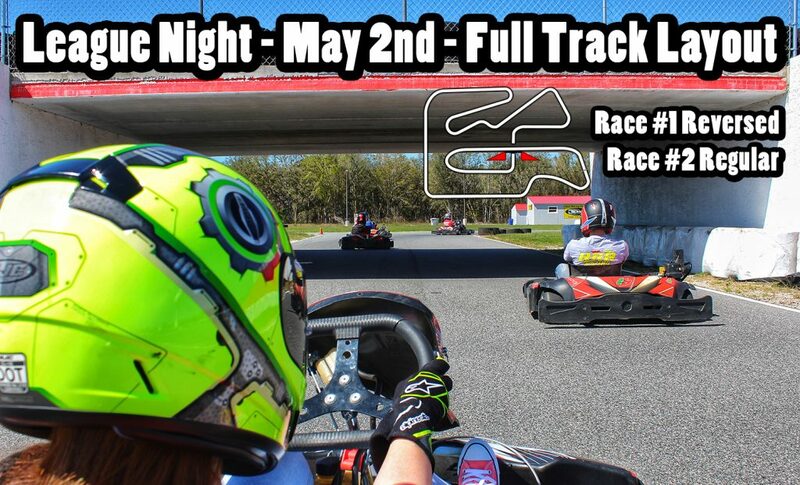 May 16th – 12 minute practice/qualifying, 1 – 40 Lap Endurance Race (Short Track Layout. Points will be given at the 20 Lap Mark (Race 3) and the 40 Lap mark (Race 4). 1 kart swap required. 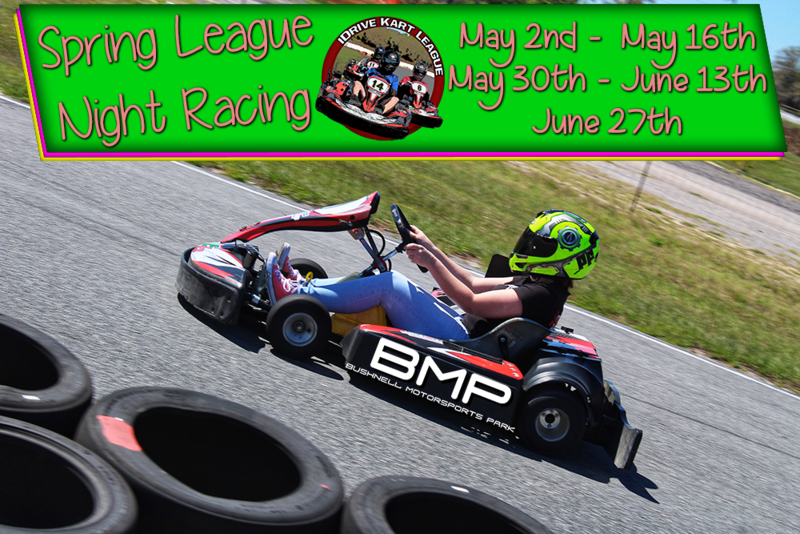 June 13th – 12 minute practice/qualifying, 1 – 30 Lap Endurance Race (Full Track Layout. Points will be given at the 15 Lap Mark (Race 7) and the 30 Lap mark (Race 8). 1 kart swap required. 1st Place – $400 BMP Gift Card, Event Winner T-Shirt, and Name on the BMP Champion’s Trophy –OR– a $400 credit towards a Simpson helmet. 3rd Place – $100 BMP Gift Card. The winner of each feature race each night will get a free rental kart ride added to their account. Sweep the night (qualify on pole for each feature race and finish 1st in both races) and win a BMP Yeti Cup!